We had been warned that if we did not get there early we would have to cue for a table and knowing how much Trevor hates to cue but also knowing how early we get up this as not going to be too much of an issue for us at all. 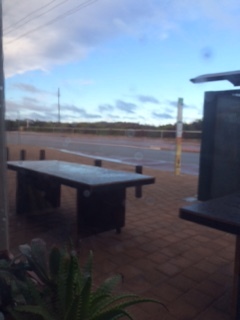 Situated just across the road from the beach, so even on a windy, rainy day the vista is great and the menu is really good too. For me of course as well as the food it really is about the coffee and making sure that it is not burnt, not too hot or not luke warm and they got it right from the start. The service from the staff was fantastic, they were friendly, charming, professional and really understood the menu really well. As it was a first visit we were going to have our usual breakfast fair but I had firstly heard that the home made hash browns were amazing and when I mentioned this to our waitperson she suggested that we try the Voyage signature breakfast dish – Norma’s Salsa which consisted of poached eggs, roast truss tomatoes, wilted baby spinach, avocado, marinated fetta and ciabatta toast. So we decided to forgo our usual poached eggs on toast with a side of mushrooms and give the signature breakfast a go and we were not disappointed. The signature dish – Norma’s Salsa – delicious! 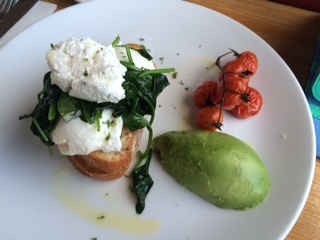 This was just a delightfully, fresh tasty dish to begin the day with and the eggs were served perfectly, the roast truss tomatoes were so tasty and the combination of the wilted spinach, avocado and marinated feta all added some subtle complexity to the dish when all combined together. The feta was a stand out for me as it was salty, smooth and a taste treat. 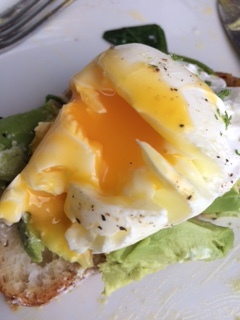 When combined with some of the poached egg and the fresh avocado it really was delicious. A perfect cup of morning coffee! Voyage Kitchen is another great find for us and we will be making the trip back there more regularly now and alternate with our other favourites for a Sunday breakfast and will be sure to get there early because when we were departing all the tables were full and a line was forming! 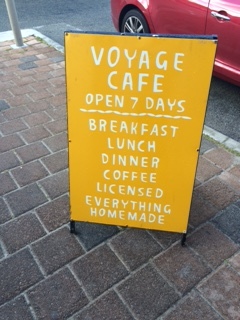 This is a great breakfast option down the coast in Sorrento and well worth the trip! 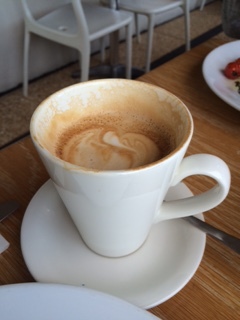 Oh and the coffee was fantastic too! Christmas Eve, Christmas Day, Boxing Day and New Year’s Day. Breakfast is served from 6:30am to 11:45am Monday-Friday, and 6:30am to 11:30am Saturday and Sunday. Lunch is served from 12 noon to 3pm daily (cabinet food is available all day). Dinner is served from 6pm to 9pm Tuesday-Sunday. The sun was trying to sneak through as we finished breakfast! And so after a wonderful breakfast and home for some domestic chores it was time to meet up with the wonderful Sally and Li for lunch at Blu Grill. As you will know I did a review for Blu Grill last week and so this was a quick return, something that we do not usually do, but given the location and our experience we decided it would be a lovely lunchtime option for a catch up with our gorgeous Sally and Li. 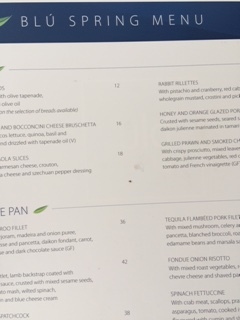 The menu is the same as the dinner one, and as it was a Sunday lunchtime we all decided to just have a main course with a couple of side dishes and then 2 of us chose to sample from the dessert menu. Once again from the moment we arrived (and the wait staff remembered Trevor and I from earlier in the week) we were welcomed, treated really well and experienced really good service once again. I chose the pan fried kangaroo fillet flavoured with marjoram, madeira and onion puree, served with sautéed pea concasse and pancetta, daikon fondant, carrot, asparagus, star anise and dark chocolate sauce. It was an absolute delight. The kangaroo was cooked to perfection and each of the accompaniments perfectly matched the flavours from the kangaroo and the marjoram, mediera and onion puree all shone through. The daikon fondant was dense, lush and just added another layer to the dish. 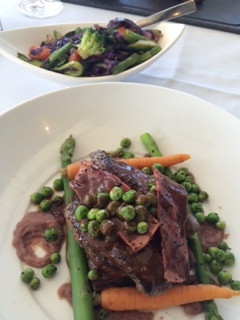 The pan fried kangaroo fillet – delicious! Roasted spitchcock with poppy seeds. 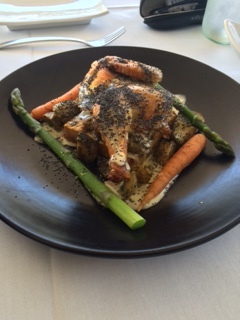 Li had the oven roasted spatchcock that was marinated with galangal, turmeric, kaffir lime with poppy seeds, potato sautéed in pesto, panisse, baby carrot, asparagus, mascarpone and champagne sauce. This was a complex dish with quite a few flavours all competing for centre stage but the chefs managed to pull it off with a beautifully roasted spatchcock that sat atop the panisse and surrounded by the baby carrot, asparagus and finished off with the mascarpone and champagne sauce. 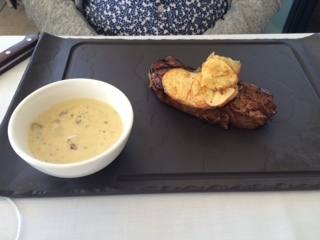 Trevor indulged in a chef selected eye fillet served with a mushroom and blue cheese sauce and topped with a crunchy potato chip. This was a simple dish that allowed the flavour of the eye fillet to be the star. The mushroom and blue cheese sauce was served on the side so that he could chose how much or how little he had to compliment the eye fillet. It was cooked to perfection. The chef’s eye fillet was cooked to perfection! 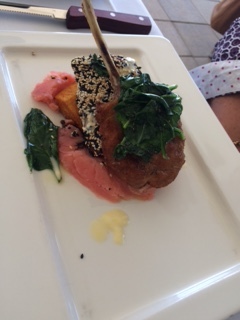 beetroot and potato mash, wilted spinach, butternut pumpkin and blue cheese cream. She really enjoyed it and if you look at my previous review of Blu Grill you can see my more in depth dissection of this dish and its wonderful flavours. We chose 2 simple side dishes to go with our main courses – Seasonal vegetables sautéed in butter, garlic, onion and mixed herbs and the mixed julienne vegetables, tomato, mixed leaves, cucumber and balsamic dressing. Both were very simple with the seasonal vegetables cooked to perfection and tossed with just the right amount of butter, garlic, onion and mixed herbs to allow for the flavours of the vegetables to shine through and once again the salad was wonderful with the home made tasty balsamic dressing. To go with our meal Sally chose for us a bottle of the Juniper Crossing Semillon Sauvignon Blanc and it was the perfect Sunday lunch drop. Light, fruity and a perfect drop to accompany our meals. Trevor went with a glass of the Juniper Crossing Merlot to have with his eye fillet and it was a perfect choice for this dish. 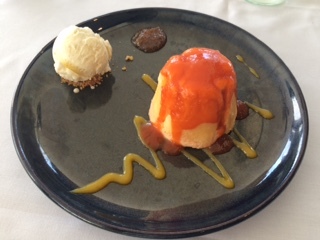 For desserts we chose the Cointreau flavoured rhubarb charlotte served with a delightful mango coulis, caramelised apple and vanilla ice cream and also the chocolate trio which consisted of chocolate fondant, white chocolate mousse and chocolate ice cream, served with ganaché. Both of these desserts were delightful in their own was with the charlotte being light airy and a perfect fresh dessert to end the meal on. 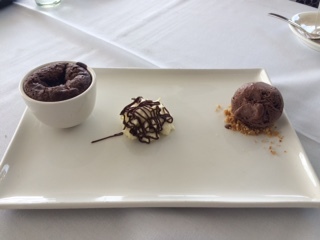 The chocolate trio was also light and the perfect size to give a taste of the three different chocolate items being presented but not allowing any of them to over power the others, the perfect serving size. Dessert delight – Cointreau flavoured rhubarb charlotte. The chocolate trio a perfectly sized dessert to end a lovely meal! This was once again another first class meal from Blu Grill and has encouraged us to book for their upcoming Evans & Tate 4 course dinner with matched wines coming up on the 14th of October. Antoine & Stanley – shoe heaven for men!